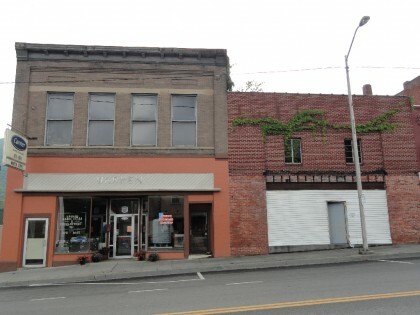 Large 2 story store front with full walk-out basement in downtown Big Stone Gap. Also has entrance from alley with loading dock. Separate sidewalk entrances for 1st and 2nd floors, alley entrance for basement. Bathrooms on 1st floor and basement. Extra lot can be used for storage or parking and has access from alley. Elevator still in place but is not currently being used. Great location at busiest intersection in town. DIRECTIONS: From Post Office/Federal Courthouse in Big Stone Gap, go East on Wood Ave. Go one block through traffic light #5 at E 5th St. Subject is 2nd building on left. Sign in window.